Drink Local . 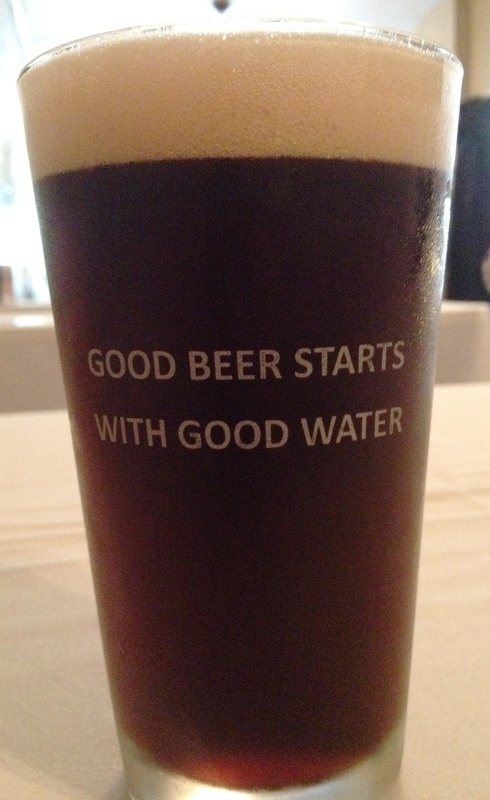 . .
You hear that phrase all the time in craft beer. And for good reason . . . it makes a difference. Anything made within a few miles of your favorite watering hole is most likely not long from the fermenter, and still retains the qualities your local brewer strived to put there in the first place. Most of us who make craft beer believe in accentuating that vibe, locally sourcing brewing ingredients whenever possible. There is, however, one ingredient that every brewer in the country has no choice but to source locally. It’s arguably the most vital resource to every community in the world. It’s also over 90% of every beer you drink, and is even the foundation for the origin of some beer styles. The original Pilseners were characterized and influenced by the soft, low alkaline water present in Pilsen, Czech Republic. So water’s important to us. It’s important to you. And it’s REALLY important to Dean Naujoks. Dean is head of The Yadkin Riverkeeper, whose mission is to protect and improve the Yadkin Pee Dee River Basin. He’s also a little nuts. Dean’s safety talk. Summary: don’t die. 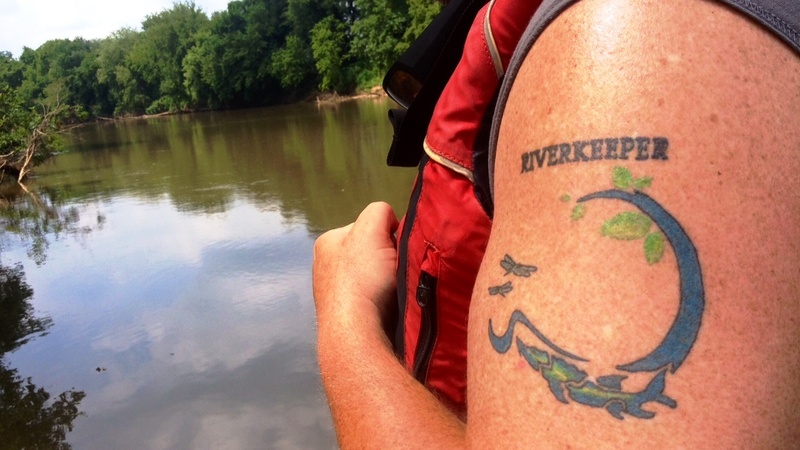 He spends the month of June, every June, paddling the entire 215-mile length of the Yadkin River. 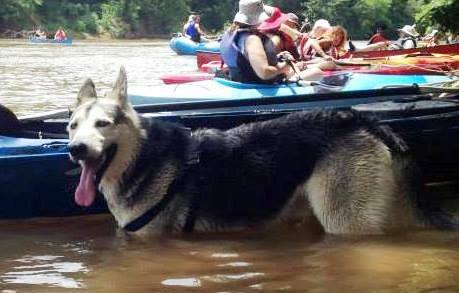 And he and his Riverkeeper staff manage to get over 600 people on the water with them, at different stages of the annual event that’s become known as the Tour de Yadkin. As you might imagine, it’s an adventure that calls for strength, stamina . . . and not a little swarthiness. Dean camps for the first two weeks of the tour, which this year equated to 3 showers in 17 days. For a guy who advocates responsible water usage, he sure doesn’t use very much. Along the way he routinely deals with any number of issues and near-calamities; from capsized kayaks, to bugs and snakes, to a singularly awkward encounter between Shiner the Paddling Dog and a baby deer. Bad Shiner. Shiner. In a more pensive moment. Dean invited us out recently to paddle a leg of the Tour de Yadkin with him and his staff, and see firsthand the health of this vital natural resource that supplies water to 734,000 people in the Piedmont. 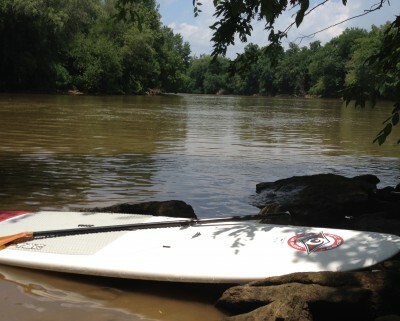 The nine miles of the river we paddled were pristine, and natural, and blessedly free of bugs and snakes. At one point a bald eagle wheeled out of the trees and circled majestically overhead. There’s something we don’t see at the brewery every day. But not all of the river is in good shape. Some parts are listed as impaired by the EPA. To the river, according to Dean, it’s “death by a thousand cuts”, the cumulative impact of all the pollution sources that are impacting water quality issues as you head further downstream. That’s why we’re thankful for The Riverkeeper, and those who work tirelessly to protect the river that’s the lifeblood of our entire region. Dean has taken on, and successfully regulated in court, billion-dollar corporationswho routinely abuse our waterways. 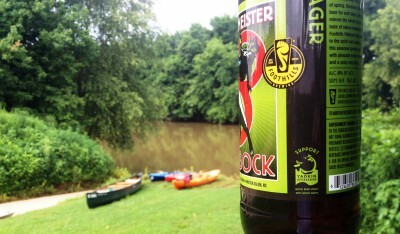 Categories: beer, environment | Tags: beer, brewery, craft beer, craft brewery, North Carolina craft beer, riverkeeper, water conservation | Permalink.